Featuring multiple key rookie cards and a strong Hall of Fame checklist, the 1957 Topps Baseball Card Set marked the next step in the evolution of vintage baseball cards, including many changes and firsts for baseball card collectors. The 1957 Topps Baseball release was the earliest baseball card product to showcase the 2-1/2 by 3-1/2 inch card dimensions that we are now accustomed to in the hobby. 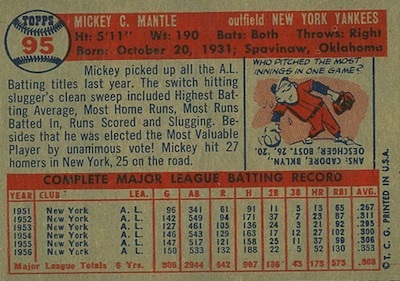 The set was also the first to feature player statistics covering their entire career on the card's back. 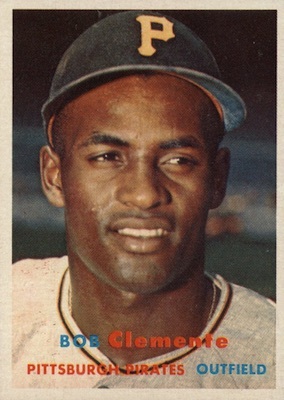 In addition, it was the first time that full color photography of the depicted players was utilized in the card design as compared to colorized player images. All of these elements combine to make it one of the most collected vintage sets of all-time. 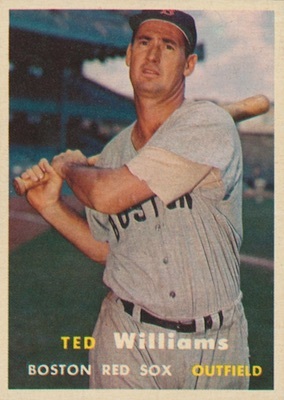 The 1957 Topps Baseball card designs center around full color player photographs and include posed action shots and portraits. The image is accompanied by the player's name, position and team written at the bottom of the card in a small and simple font with varying colors. A white border around the full area of the card plays into the card's centering when it comes to grading. It also helps to maintain the eye appeal of the set even if the cards display edge damage because the border prevents the wear from not interfering with the card image. With the inclusion of full career statistics on the card back, Topps still managed to find room for other components collectors had become accustomed to seeing. Biographical information, a narrative write-up and a one-panel trivia cartoon are all showcased in an information-filled, but not busy, 1957 Topps Baseball card back design. 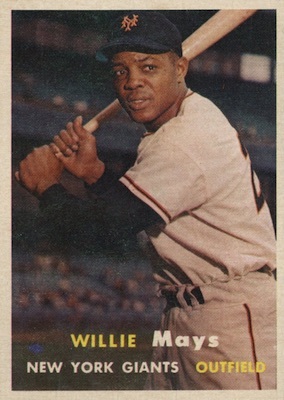 Many valuable rookie cards can be found within the 1957 Topps Baseball set. 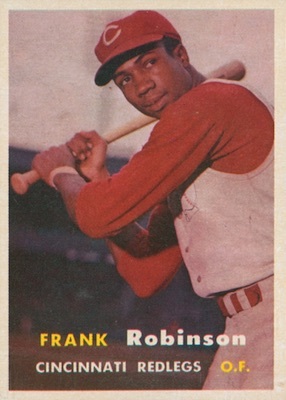 Frank Robinson (#35), Brooks Robinson (#328) and Don Drysdale (#18) are the top options. 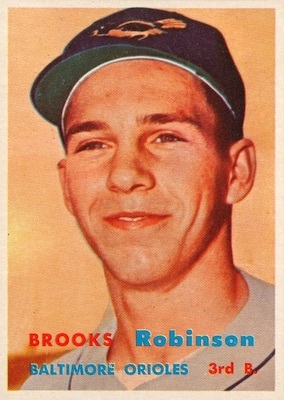 Other notable rookie cards include Bobby Richardson, Bill Mazeroski, Rocky Colavito, Tony Kubec, Jim Bunning, and Whitey Herzog. 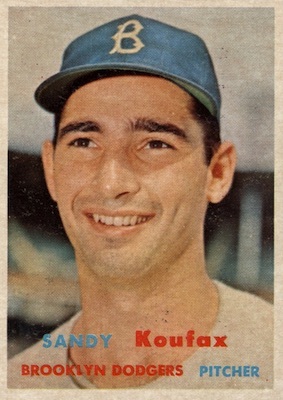 Sandy Koufax and Mickey Mantle are the top veteran cards in the set. Similar to 1956 Topps Baseball, the 1957 Topps set includes an exciting assortment of team cards. 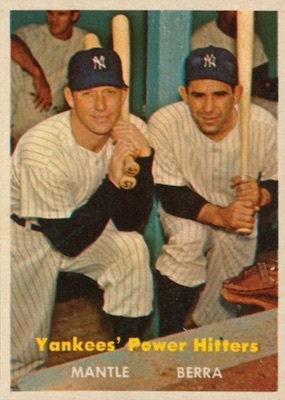 Additionally, 1957 Topps features several player combo cards, which hadn't been produced since 1954, can be found. 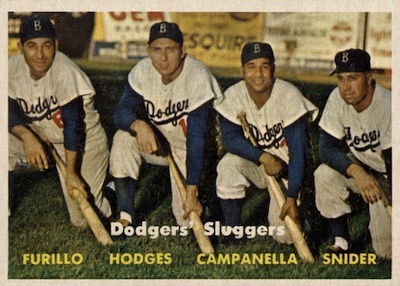 Each carries a tagline and multiple subjects, including Dodgers' Sluggers (#400 Carl Furillo, Roy Campanella, Duke Snider, Gil Hodges) and Yankees' Power Hitters (#407 Yogi Berra, Mickey Mantle). 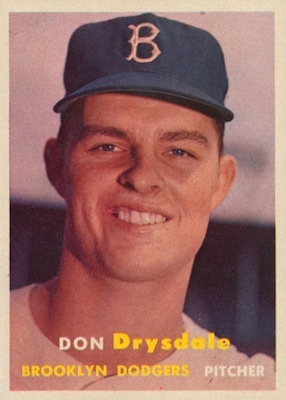 Again, league presidents are featured, but they are combined on a single card in '57 Topps. One interesting fact to note is that the 1957 Topps Baseball set features the last printed card of Roy Campanella from his active career. 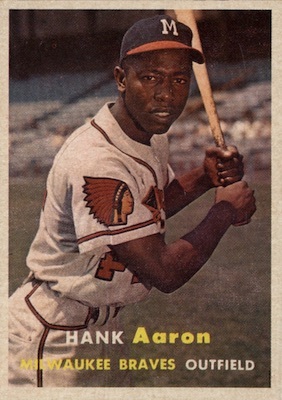 Also, Hank Aaron's card (#20) actually showcases the slugger reversed. In addition to a multitude of uncorrected errors, there are two versions for Gene Baker (#176). The error card features a printing issue on the back that resulted in his name appearing as Bakep. There is also a corrected version. 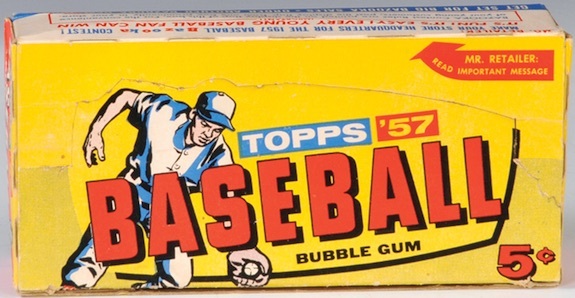 Distributed in five separate series, it is the fourth series of 1957 Topps Baseball that is typically the most difficult to find. Four unnumbered checklist cards accompany the set and each feature multiple series. 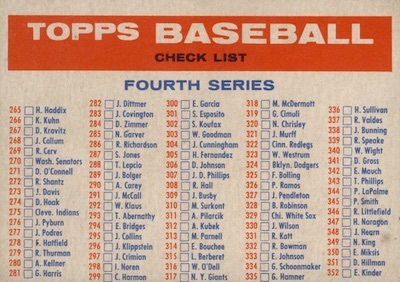 The checklist cards can be extremely difficult to find in any sort of mid-to-high grade condition. The original retail price for a wax pack of cards was five cents and packs included two Bazooka contest game cards. One-cent packs were also available. Checklists can be found with both a Big Blony ad or a Bazooka ad. Most set builders include the various contest cards and checklists as part of the master set, but they are not required for completion of the bast set. 414 cards. Shop for base sets on eBay. Double prints (DP) are noted below. 1957 Topps #161 Pittsburgh Pirates Team Card PSA 9 " LOOKS NICER "
One thing a lot of people overlook when taking a quick look at the 1957 Topps Mantle is the fact that there is another person in the picture that has been blacked out but is still visible. A camera man is to the right of Mantle and was later blacked out for the card’s production. 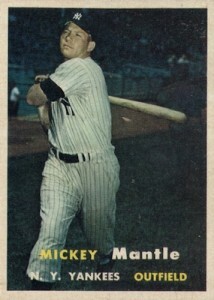 The card is sometimes referred to as Mantle’s “Ghost” card. Check it out! One of my favorite sets of all time, the 1957 Topps set is a difficult set to complete, with cards from the next-to-last series (#265-352) tough to find. Fortunately, I completed the 1957 set sometime in the late 1980’s, at a time when old baseball cards were a lot cheaper back then. Back in the late 1970’s, you could get the ’57 Topps Mantle for $12, while in the early 1980’s, you could buy the ’57 Mays and Aaron for around $20 each. 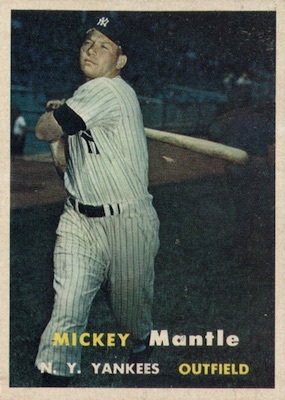 The price of Mantle rose considerably since then, and his ’57 card was always more expensive than any other card back then. One quibble on your checklist. The name Billy Pierce is spelled “Billy Piee”. Card number 160 and a great pitcher.